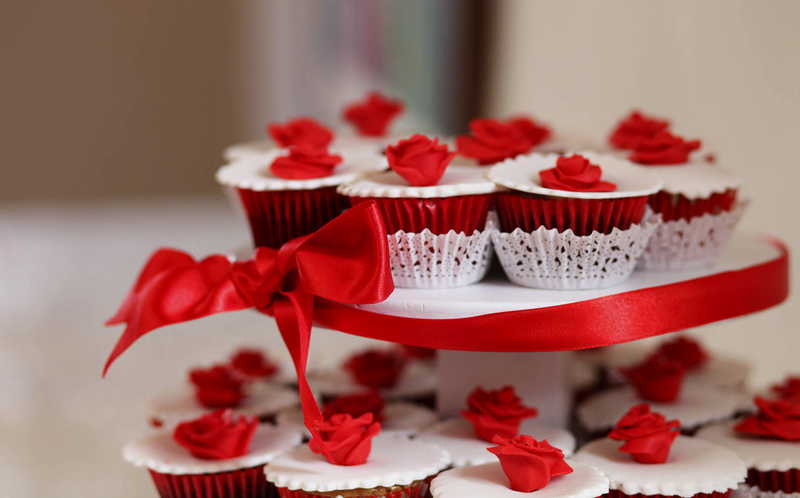 A red and white wedding never goes out of fashion because red is the color of passion and romance and it is quite glamour to use it for a wedding reception. Here some snapshots from one of our wedding celebrations where red and white were the colors selected for the occasion by bride and groom. 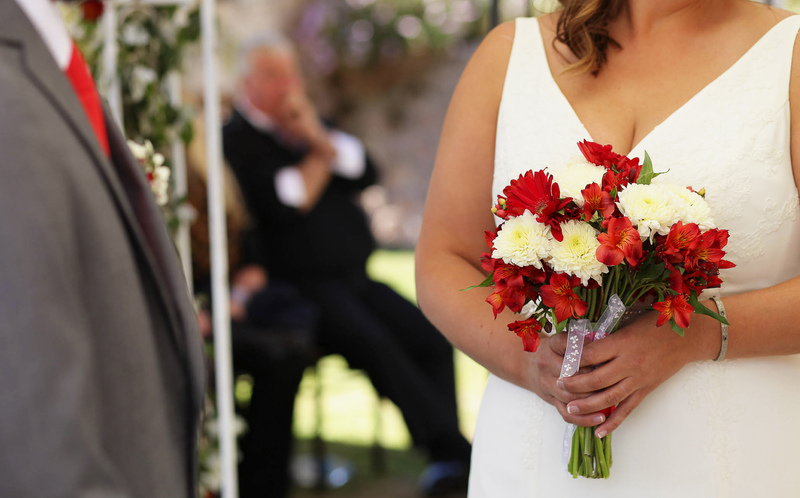 The bride opted for a classic bouquet with red and white flowers wrapped with a thin white ribbon. This is a very simple and elegant bouquet, ideal for an intimate outdoor wedding. 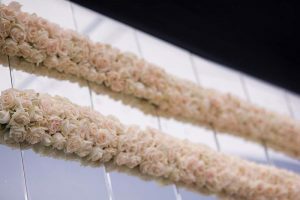 Be sure to have everything ready before picking the flowers for your bouquet because this needs to be in line with all the other decoration elements of your wedding. 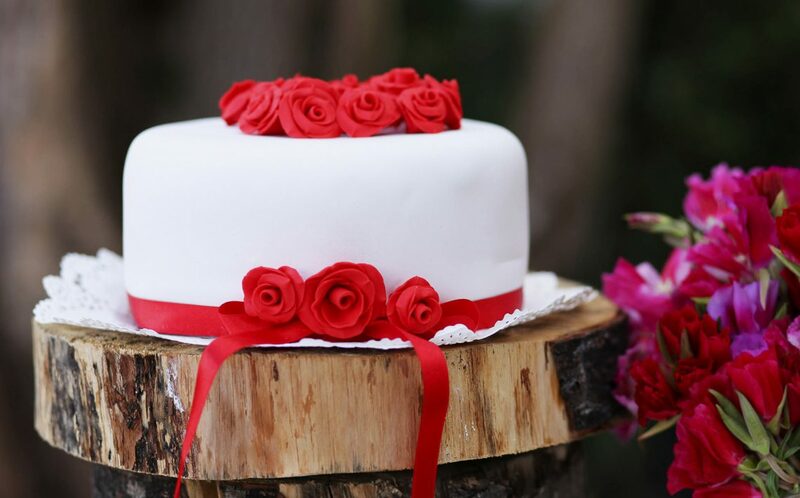 The wedding cake was very simple, a 1-tier cake covered in white fondant and topped with little red flowers decoration and wrapped with a tiny red ribbon made of fondant. 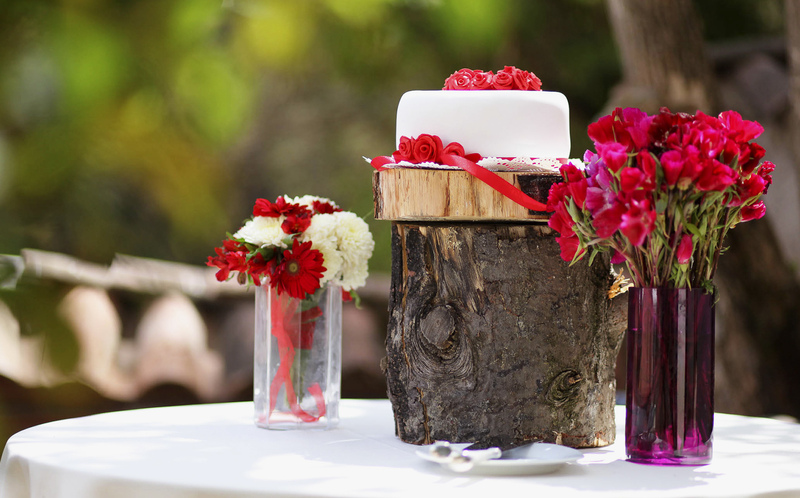 Due to the rustic style of the wedding we decided to place the cake on a wooden base, and to add two little glass vases on the table. A part from the wedding cake bride and groom decided to have some red velvet cupacakes topped with white fondant and a little red flower. They were soooo cute! To keep going with the red details, the table setting had several red accents: you can see the napkins and the little flowers centerpiece, which brings a romantic atmosphere to the rustic reception ballroom. It is important to stick with little decoration elements if you choose strong colors such as red, otherwise it could be way tooooo much. The blue tones combined with green accents are perfect for a summer wedding, this is a fresh and elegant color for a romantic bride. 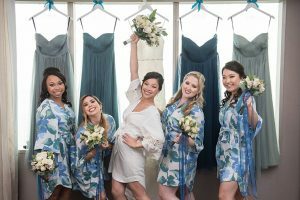 In this wedding we loved how different tones of blue combined together, especially for the bridesmaids’ dresses and the awesome flowers bouquets with long multicolored and flowy ribbons. They were really fabulous! Blue tones were everywhere at this wedding: the cake topper, flowers decorations at the ceremony, bride’s shoes (so stylish!!! ), photobooth backdrop and much more! 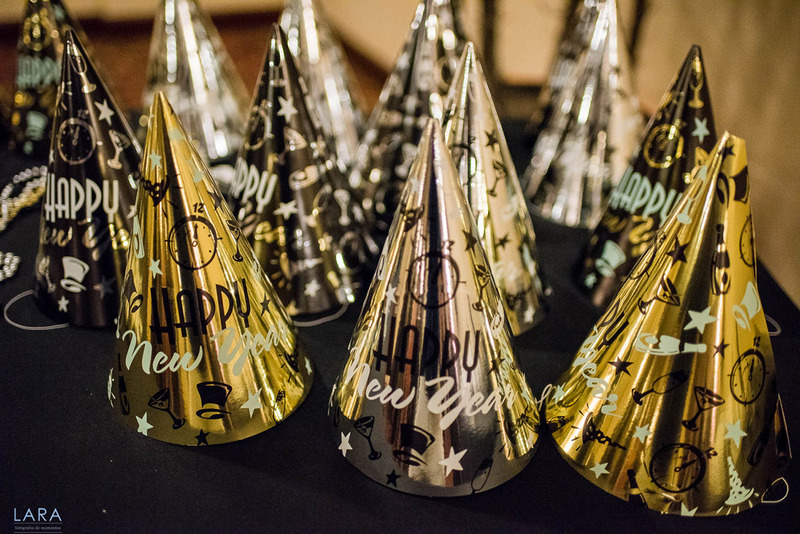 This is a crazy time of the year; people in the event organization industry are extremely busy with their New Year’s Eve celebrations and it is going to be extremely challenging for me to find suppliers available that day! Most suppliers will charge twice as much the normal price and if we are lucky enough, sometimes they charge triple! And it would be hard to negotiate a good service for a fair amount of money in this time of the year! 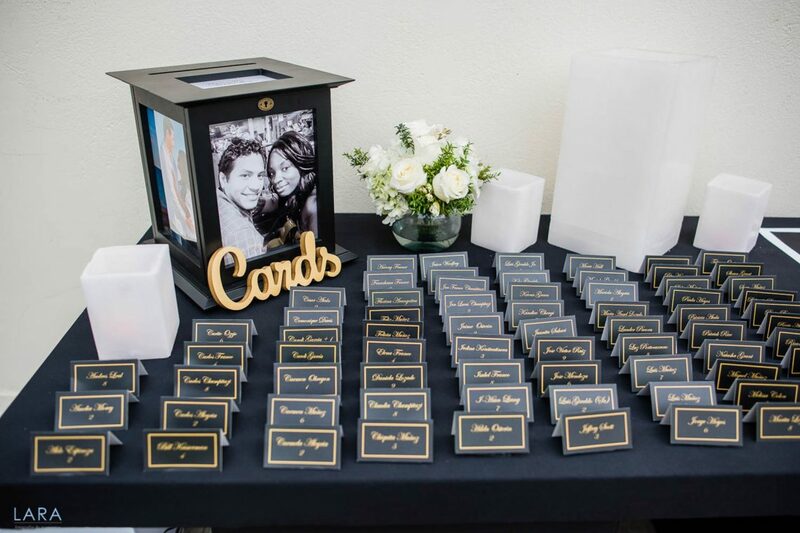 This must definitely be a SPECIAL MOMENT, not only for the couple, but for all the wedding guests! And when I say SPECIAL MOMENT I really mean it in this occasion! You know December the 31st is the most important day of the year for many people and they have high expectations on how to celebrate it! 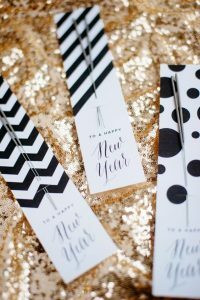 Glitter: when thinking about the color scheme do not forget that glitter is a very important element, so go for a silver and gold, black and silver, black and gold kinds of color palette. 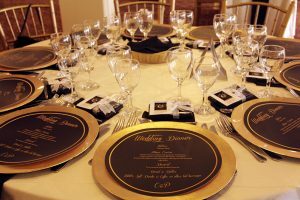 In this occasion bride and groom decided to opt for a black and gold color palette and it worked extremely well. 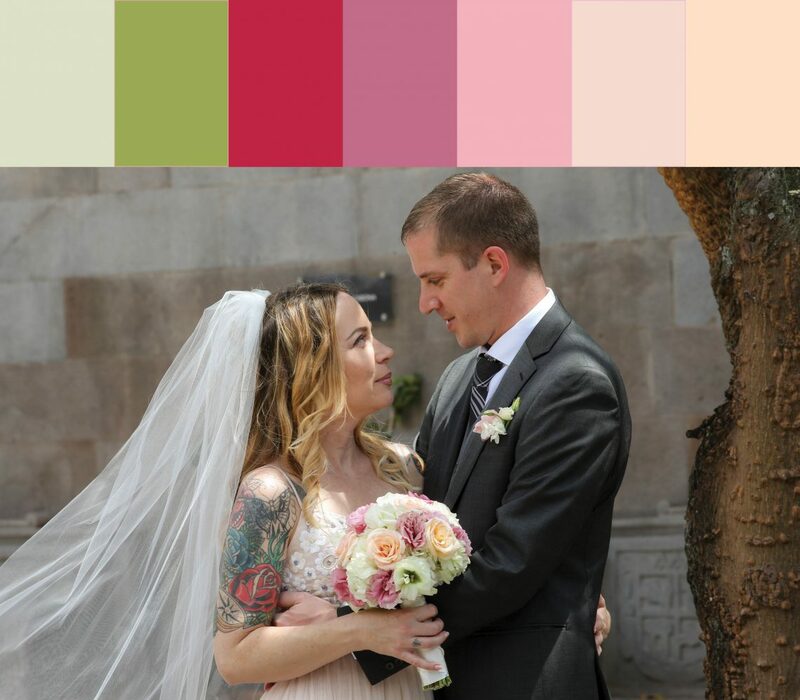 Also guests’ dress code sticks with these colors as well, which was nice especially for the pictures. Bubbles: this is an essential element of the celebration! 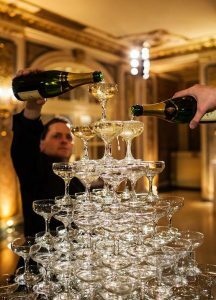 Generally you cannot run out of Champaign or any kind of sparkling wine for your wedding celebration, imagine if your event is on New Year’s Eve! This cannot be a possibility! I suggest you to be prudent and order more Champaign than the one you would order for a normal wedding. Keep in mind that this is a special day and all the people will party hard and they might choose to drink Champaign all night considering the occasion. You can also consider the idea of a Champaign tower. Midnight Toast: my advice here is “have a plan” for the midnight toast! This should be a special moment and you might want to arrange a nice countdown. So coordinate with the Dj some sort of countdown and a hit to play at midnight, also you can arrange a balloon drop using gold and silver balloons, always stick with your color scheme! 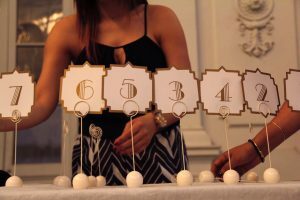 Be creative and find a way to make this a very special moment for your guests, and remember they are there to celebrate your union, but also to celebrate New Year’s Eve! 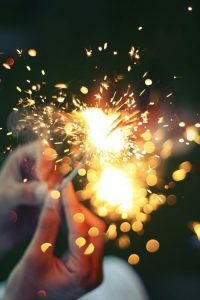 Sparklers: even though the majority of venues do not allow sparklers and fireworks, if you are lucky and find one that allows them, use it since they are a staple for this kind of celebration. 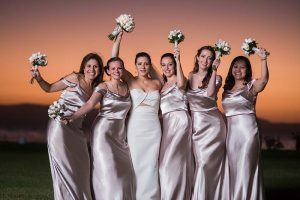 And they also help you creating a very special atmosphere; you will have great pictures with the lighting they create, so if you can go for them! 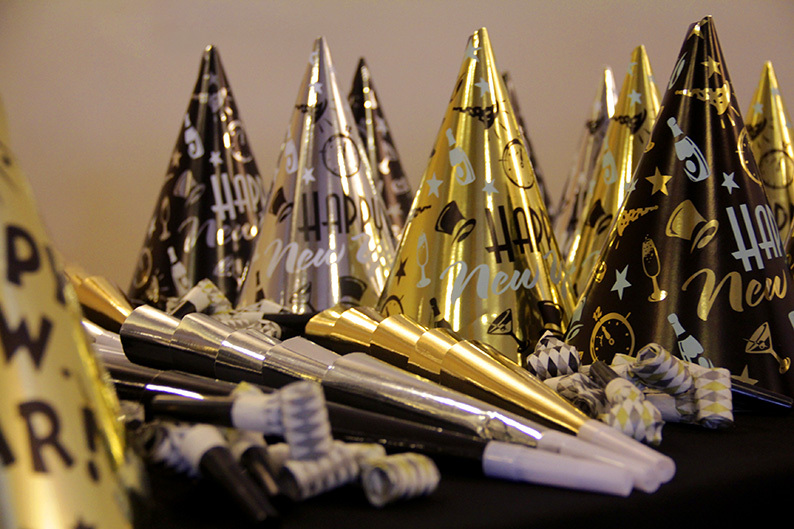 Party Props: do not forget that people want to have fun and party that day, so buy New Years’ Eve party items, such as glitter hats, noisemakers, party horns, confetti poppers, silver and gold tiaras, and New Year ’s Eve crowns. 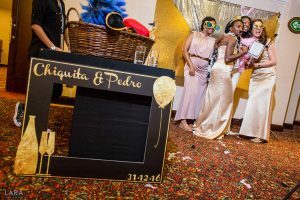 They will certainly add festivity to your wedding celebration and you will have fun pictures of your event! 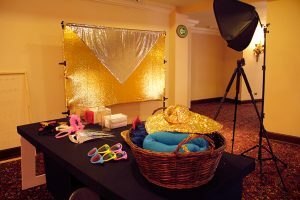 If you are planning to have a Photobooth the New Year’s Eve theme will be a great plus and your funny pictures awesome! You are still on time to plan your New Year ’s Eve wedding to welcome the 2018, so why don’t you start right now? 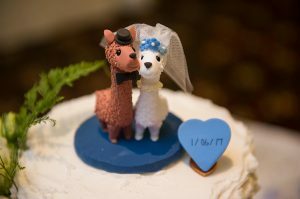 As always if you have questions or you want to get married in Peru, contact me at info@sayidoinperu.com and I will be happy to help you with your destination wedding celebration! 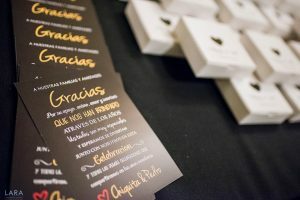 Invitation cards are the business cards to your wedding celebration. From your invitation card we can understand what is your favourite wedding style. Do you have the venue, the date and time? 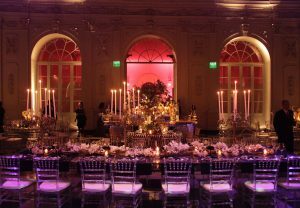 So now start thinking about your wedding style, which should reflect your tastes and personality! Once you get this clear you can start preparing your invitations! 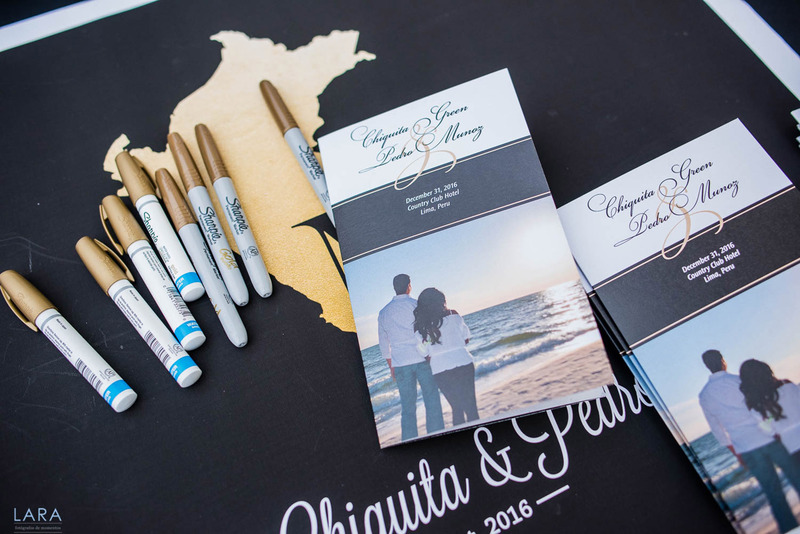 Here you will find 4 invitation ideas that can fit different wedding styles! i am sure you will find the one you are looking for! 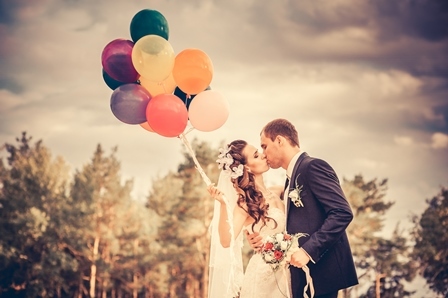 Do you want to get out of the conventional wedding stuff? This invitation is ideal for a modern wedding. The abstract image of the envelope background can give a great result if you are looking for something different. The blue, green and pastel colors give us this quiet that only nature can give us. Ideal for an intimate wedding or a beach wedding. 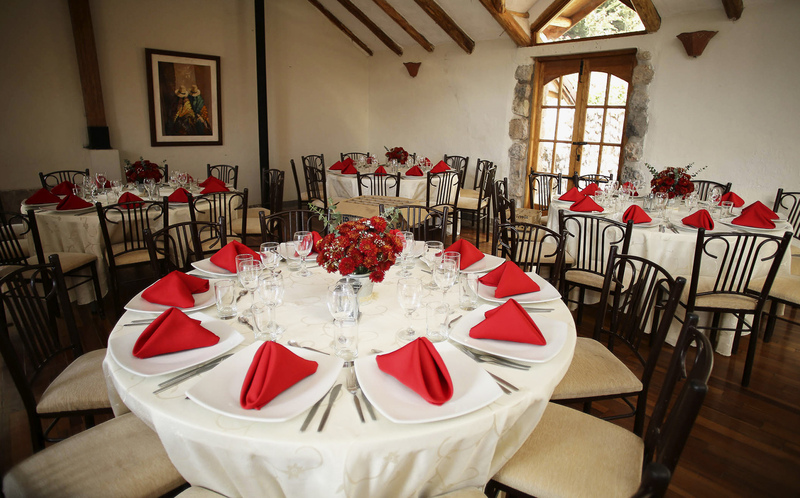 I usually suggest this style to couples who want to tie the knot in Cusco, sorrounded by great energies and special landscapes. 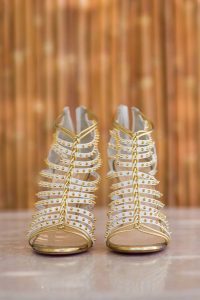 Gold is that spark of joy and happiness that every glamorous and elegant bride wants to represent. Gold can usually be combined with any color, in this case it is combined with blue, which makes a beautiful and elegant contrast. the details also recall the famous baroque style. This invitation would look perfect for classic weddings, in classic venues with high ceilings and columns. There are people who love details, abundance and complex stuff and others who love simple things. 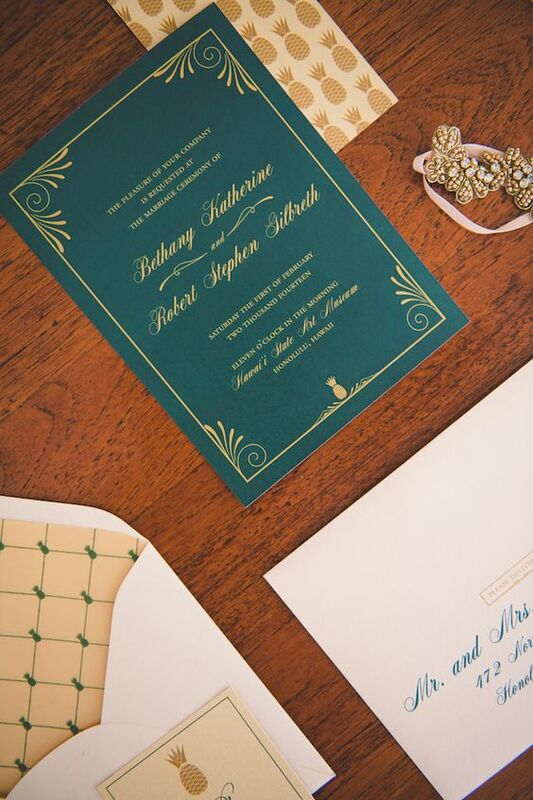 This invitation is inspired by simplicity and elegance. The combination of three types of typography gives dynamism to the invitation and the light pink background ad a touch of sweetness. 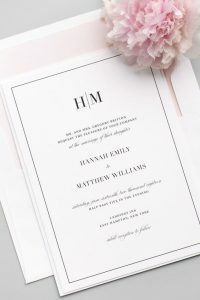 Whethever you have opted for a vintage wedding or a country wedding, a rustic invitation is definitely the best choice. 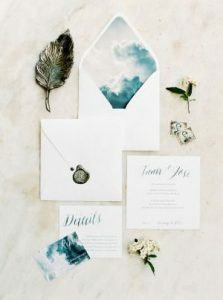 Being rustic does not mean that you lose elegance, which is a plus when choosing this type of invitation. 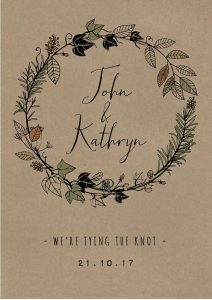 The leaf detailing around your names is the perfect detail to reflect your love for nature, plus you could use recycled paper to emphasize your rustic concept! 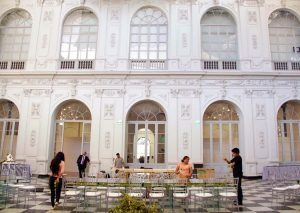 Few weeks ago we had a wonderful wedding ceremony and reception in Lima. 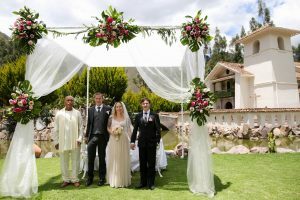 Bride and groom were looking for an unforgettable destination wedding in Peru and they were in love with Art Deco style. Everything needed to be inspired to the 20s and to the style of that time, let’s say “The Great Gatsby” style. Do you know “The Great Gatsby”? If not have a look here (https://en.wikipedia.org/wiki/The_Great_Gatsby) and read the book. It will literally transport you in the 20s and you will enjoy the reading. So what is this Art Deco style about? Art Deco was one of the most fashionable, iconic and pioneering international design and architecture movements in the history. This style was characterized by geometric shapes, such as triangular, trapezoidal and zigzagged ones, smooth lines, chevron patterns and elements that bring us back to the Greek and Roman classicism. As for colors, Art Deco introduced neutral colors, black and white were a must, as well as grey and beige…let’s say that monochromatic approach is another Art Deco’s feature. Also the key to recreate this style is to add bright metallic elements, for instance using color splashes of gold and silver. 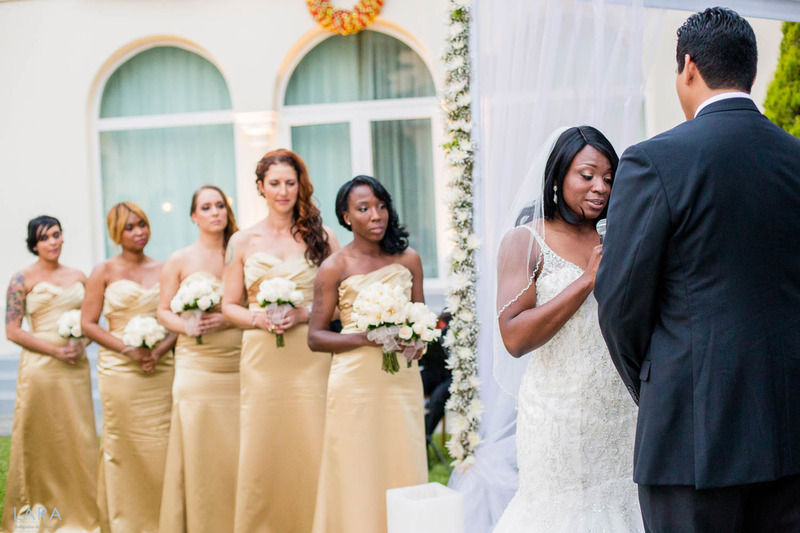 Being a wedding planner also means research and investigate to make couple’s wishes come true! 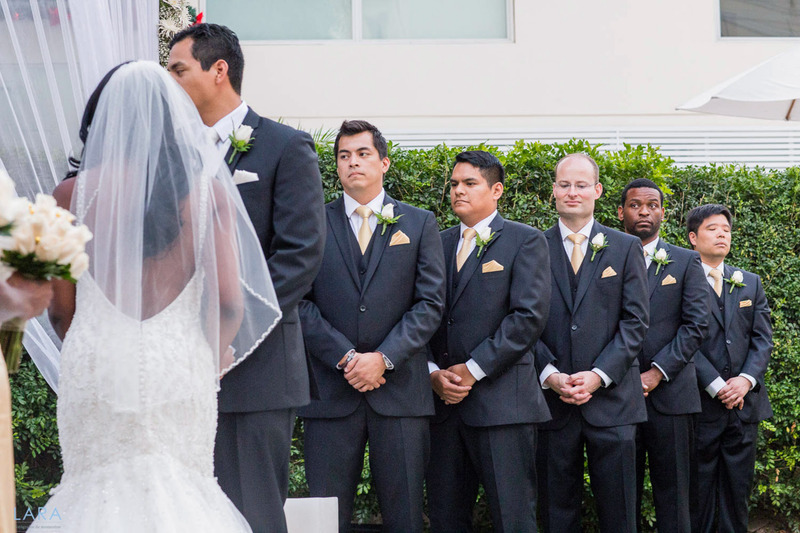 This wedding was all about black, white and some gold accent. 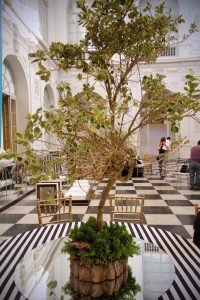 We found the perfect venue with black and white floor tiles, perfectly in line with the style bride and groom were looking for. Checkerboard floors are very versatile and with the right decoration elements can also create a cozy atmosphere. 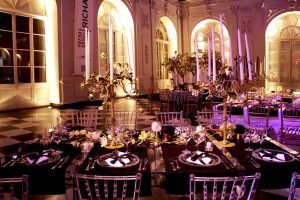 The decorators added many white orchids and moss for the table decoration with glass vases filled with water and white candles, several types of tables of different shapes and dimensions, different kind of chairs and tablecloths, as well as different kind of centerpieces. The tablecloths used were basically striped in black and white, or total black or total white. 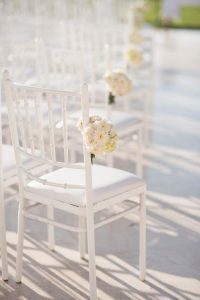 There were different types of chairs and cushions, transparent chairs with white cushions and gold chairs with black and white striped cushions, which help creating an elegant and sophisticated atmosphere. 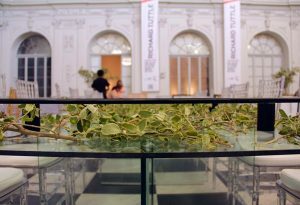 As centerpieces the decorator decided to opt for white orchids with a combination of glass vases filled with candles or water, moss and tree branches, in some table they also placed a tree (a real one!!!) rounded by moss. 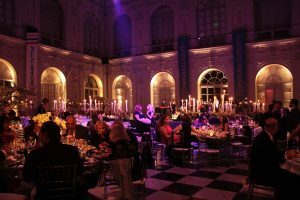 It was like being in a fairy-tale, the reception area was really beautiful, and although they used very different decoration elements they managed to create a charming harmony. The atmosphere they recreated was fantastic with the right balance between cold and monochromatic colors, gold accents and natural elements (trees, moss and flowers). 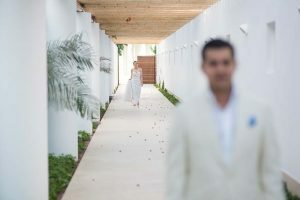 When you stepped into the wedding reception area you totally forgot about the world outside and the idea was to make guests feel transported in a different age and in a charming “Art Deco fairy tale”, where bride and groom were the main characters. 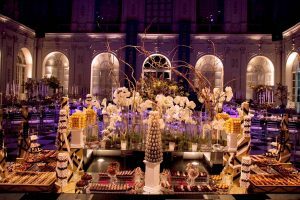 The sweets table was a great success, in perfect style with the Art Deco patterns. 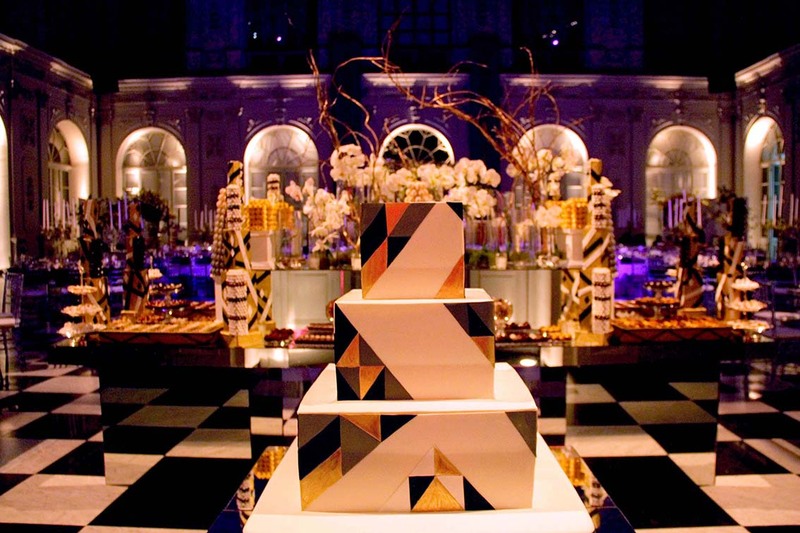 Main colors used were black, white and gold, with geometric shapes and smooth lines, triangular pyramid of French macaroons, gold pyramidal structures, mirrors, white orchids, glass vase with water, moss and white candles. 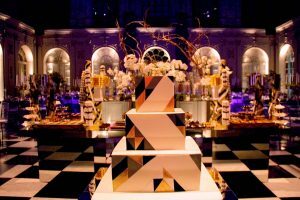 The wedding cake was also amazing, a three-tiered square cake covered with fondant and enriched with gold and white geometric decoration. 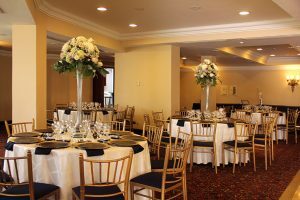 The lighting in the entire reception area was perfect, a soft and dark lighting with accent on the sweet table, guest’s tables and especially the long squared groom and bride’s table. Bride and groom choose to share the table with the wedding party and close friends. 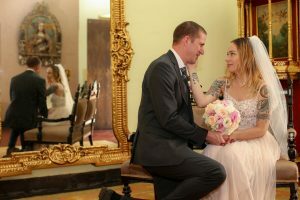 This wedding was a total blast, we loved organizing every little detail, working closer with the decorators to make real what bride and groom had in mind and we really loved how the decoration perfectly fit the beautiful venue. Light blue and pink tones are a perfect combination if we want to create a sophisticated and romantic atmosphere. 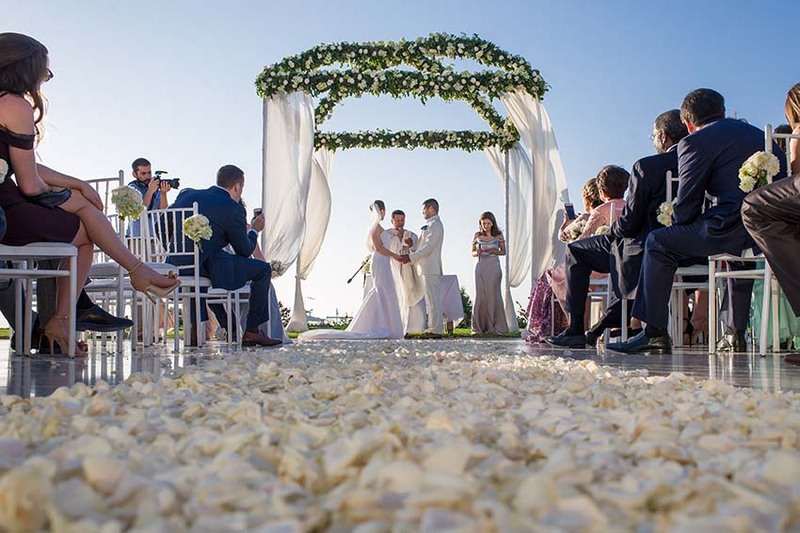 If we add some green detail for example foliage in the flowers we can reach the perfect contrast for a fun, elegant and romantic beach wedding. 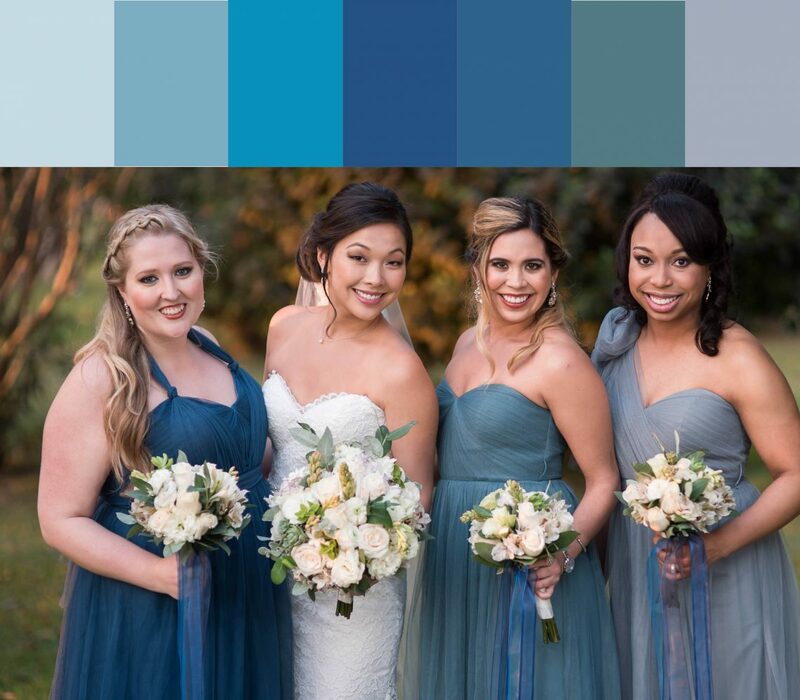 Bridesmaids can opt for neutral colors dresses which perfectly combined with location while the bride will opt for a white dress like the ocean’s foam. And do not forget about the shoes! This is an extremely important detail…we suggest to opt for gold and white shoes. The groom can opt for a cream suit, which will be perfect at the bride’s side. Better with some color details which will drow guests attention. These tones are very appropriate to the location, since they allow to recall the ocean breeze, its freshness and its romantic side. 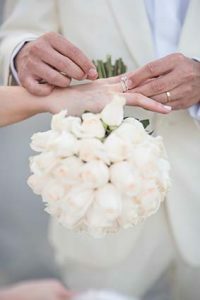 Flower bouquets apart from being the perfect complement for a dream wedding have a great importance for brides, and they are a detail you should never overlook. 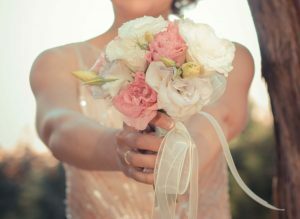 When bride is going down the aisle guests will look at your bouquet for sure, so choose it carefully and most important try to stick with your wedding color palette while choosing color and shape of the flowers. They have been used as amulets since ancient times, so the choice of a specific flower, a specific color or shape has a meaning, such as purity, good luck, joy, happiness, etc.. 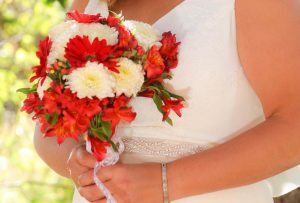 Here are some bouquet options from our brides, each one has an important meaning for the bride who chose it. 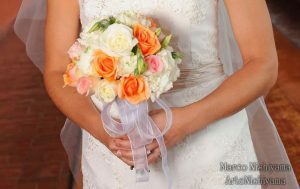 For a vintage wedding we suggest delicate flowers in light pastel colors, such as light ping, light orange and blue. Pink roses are perfect for romantic weddings, especially mixed with white ones. 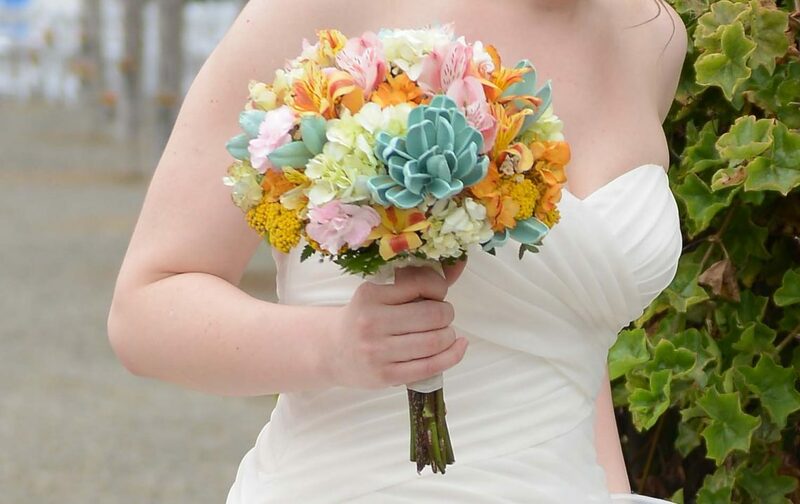 This kind of bouquet is perfect for sophisticated bride. 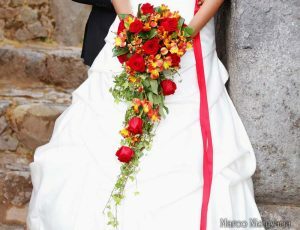 If you want a glamorous wedding red roses is what you really need, better if combined with green foliage. As you know bouquets can have very different shapes, what do you think about a cascade red rose’s bouquet, like the one in the picture? We actually loved it! If you want to stick with traditions, you can just go for a classic white roses bouquets, round style! 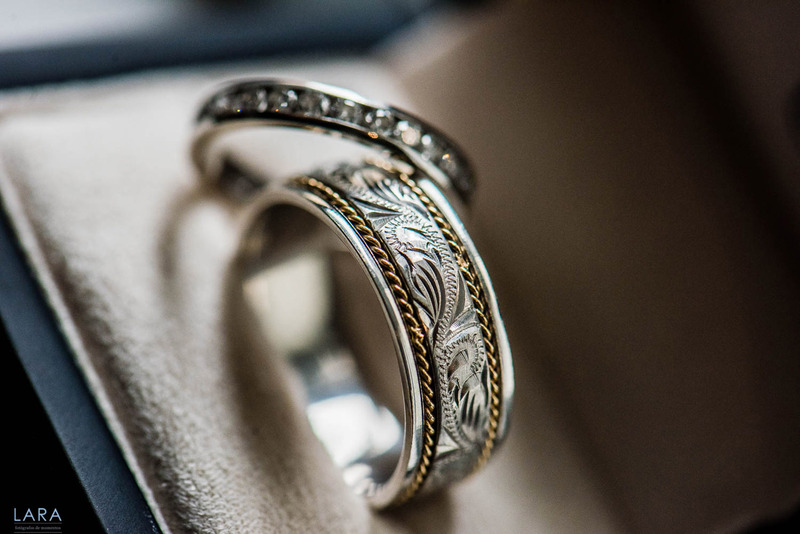 This is perfect for a classic wedding!